Creativity always feels different for me during the first part of a new year, or the start of spring – or the beginning of fall. Life is like a blank canvas: Full of potential, ready for yet to be realized and wondrous imaginings – a fresh start. So, what better time to talk about a key part of the creative process? A part that’s, unfortunately, often missing as we stare down our multiple and metaphorical blank canvases. I don’t think you have to be to be a coach to understand – or to know why this hit me so profoundly. Our society can be so cluttered. How desperate we sometimes are to fill up the spaces in our lives with stuff, noise and superficial connection. Our wants, our addictions, our often frenetic way of being. The running to here and to there; trying to do this or that. And quickly. The feeling of no “real” time. No time for ourselves; no time for each other. The pervasive loss of silence, space and time to ponder. Creative process is the process of giving silence and space to questions. And I think the responding coach is right. 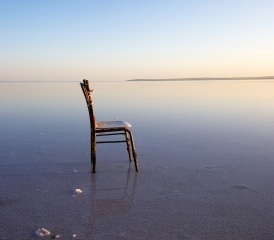 No matter how often it’s discussed, we coaches (and all of us) neglect to offer enough: A deep enough silence or a long enough space around the questions we ask our clients, our friends, our families, our lovers and ourselves, for truth and beauty to emerge. This is a new day. It always is. A blank canvas is before you. You, too, might be feeling the excitement, anticipation, even anxiety of your creative self, all fresh and clean; her or his eyes, ears and mind open to the magnificent and brilliant creations to come. With silence and space, I’m asking: What do you want to create this year?